Sometimes I can't decide what shoes to wear with an outfit, there are just so many options! I wore this outfit to a dinner with some family friends. I wanted to wear the heels so I'd feel a little dressier, but I also knew everyone else would probably be casual so I thought I should wear the flats. Needless to say I was a weirdo and brought both pairs with me and changed into the flats before getting out of the car. Oh well! It's good to have options. The weather was oddly warm the weekend I wore this, I didn't need my leather jacket. Sometimes you just can't decide on the right shoe until the very last minute! The shoes totally change the outfit! I vote heels - so fierce on you. haha i'm always the same about shoes. The heels look great with it! I feel the same way about shoes too!!!! I am always going back & forth debating which style of shoes would go best with various outfits. I love your choices in these photos. Those heels are so gorgeous, they make such a statement! Love both shoes. They completely transform the outfit! 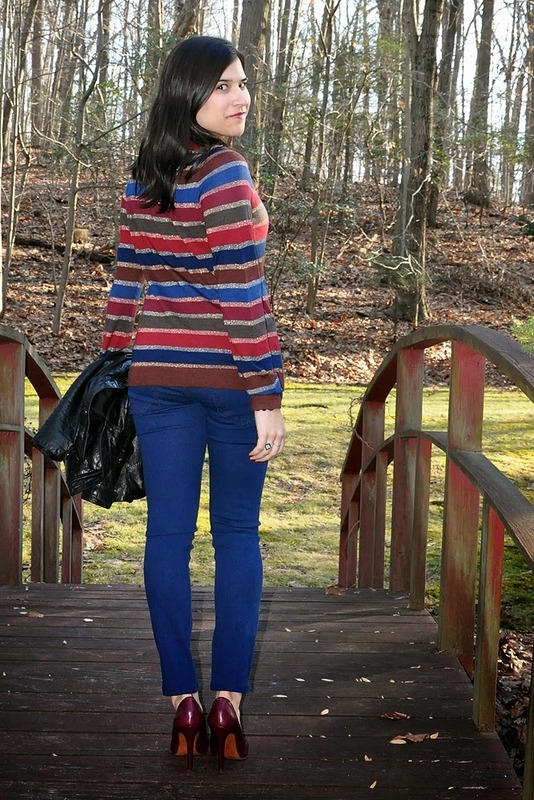 The colorblocking the flats coordinates too perfectly with the sweater to not wear them! The weekend it was warm enough to not really need a jacket. That sounds like a million years ago right now.